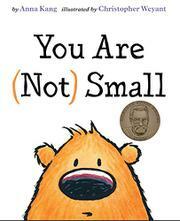 Fuzzy, bearlike creatures of different sizes relate to one another in an amusing story that explores the relative nature of size. A small purple creature meets a similarly shaped but much larger orange critter. The purple creature maintains that the orange creature is “big”; the orange one counters by calling the purple one “small.” This continues, devolving into a very funny shouting match, pages full of each type of creature hollering across the gutter. This is followed by a show-stopping double-page spread depicting two huge, blue legs and the single word “Boom!” in huge display type. Tiny, pink critters then float down by parachute, further complicating the size comparisons. Eventually, these brightly colored animals learn to see things in a different way. In the end, they decide they are all hungry and trudge off to eat together. The story is told effectively with just a few words per page, though younger readers might need help understanding the size and perspective concepts. Cartoon-style illustrations in ink and watercolor use simple shapes with heavy black outlines set off by lots of white space, with an oversized format and large typeface adding to the spare but polished design. While the story itself seems simple, the concepts are pertinent to several important social issues such as bullying and racism, as well as understanding point of view.